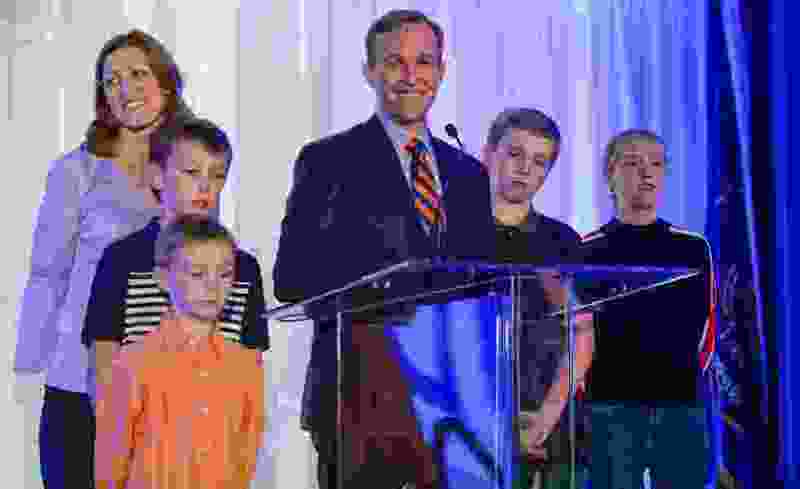 Leah Hogsten | The Salt Lake Tribune Utah's 4th Congressional District Democratic challenger, Salt Lake County Mayor Ben McAdams, thanks his supporters, joined by his wife, Julie, and children, Robert, Isaac, James and Kate, at the Utah Democratic election night headquarters at the Radisson Hotel Salt Lake City, Tuesday, Nov. 6, 2018. Election night vote counts were too close to call in the race between GOP Rep. Mia Love and Democratic Salt Lake County Mayor Ben McAdams — extending a 4th District race that always was close, with recent polls showing the race was tied. But McAdams was leading 51.4 percent to 48.6 as of 7 a.m. Wednesday. That was close enough that McAdams said he figures he must wait perhaps days for late-arriving by-mail ballots for a clear victor to emerge. Love also hunkered down for possibly a long wait for more results. Most of the votes counted Tuesday evening came from Salt Lake County, where the bulk of Democrats in the 4th District live. Relatively few results had been counted in Love’s GOP stronghold in Utah County — which had reported Election Day issues with long lines. Utah County Clerk Bryan Thompson said a few voters were still in line just before midnight, four hours after polls closed — but his office did not plan any further voter updates for the night. He said he could not venture a guess at how many votes in his county have yet to be counted. Thompson said those still in line near midnight were people registering to vote on Election Day. He said other reasons for long lines were that more people chose to vote in person than expected instead of sending in ballots by mail. Also, “Voters were taking 10 to 15 minutes to vote because of the length of the ballot,” instead of the usual two or three minutes, he said. Also, Salt Lake County Clerk Sherrie Swensen said that up to half of the votes cast on Election Day at some voting centers in her county were provisional ballots from people who registered at the polls. She said it will likely take several days to verify their information and count their votes. About 85 percent of district voters live in politically mixed Salt Lake County, and 11 percent live in Utah County — which tends to vote Republican by large margins. Love in previous elections has lost Salt Lake County, but still won the election. McAdams and Love waged one of the state’s most bitter and expensive campaigns ever — costing nearly $10.5 million. Plenty of outside money and ads poured in, showing the race has been one of those focused on nationally in determining whether Republicans or Democrats will control the U.S. House. The campaigns say the race has been close because of the big-spending, well-known candidates, the rare Utah district where Democrats are competitive — and perhaps a blue wave created by ambivalent feelings about President Donald Trump even in heavily Republican Utah. “If Hillary Clinton had won the presidency in 2016, it wouldn’t be this close,” and district Republicans would probably be more excited to help Love and fight Clinton, Love campaign manager Dave Hansen said. McAdams himself sees the races as close both because of disdain for Washington and a desire for bipartisanship. Jason Perry, director of the Hinckley Institute of Politics at the University of Utah, also noted that Love’s campaign claimed that electing McAdams would help make Nancy Pelosi the speaker of the House, while McAdams’ supporters argued he would better help keep Trump in check. “I don’t think those kind of attacks worked very well,” Perry said. “People don’t really believe that a vote for Mia is a vote for Donald Trump, and they don’t believe that a vote for McAdams is just a vote for Pelosi. I think people throw out those names because they are polarizing. In fact, the families of McAdams and Love were close for years and went to movies, dinners and sporting events together. The friendship crashed to an end when McAdams chose to challenge Love. She said he told her he had no such plans. Polls showed early that Democrats and Republicans essentially were already settled on support of their own candidate, Perry said, so focus turned largely to unaffiliated voters, and negative ads especially targeted them. Perry said an attack that seemed to have traction against Love — and help swing some unaffiliated voters to McAdams — were hammering her for raising $1 million for a primary she never faced. The Federal Election Commission initially raised questions about the legality, but eventually gave her emails that she claimed exonerated her — and she called for McAdams to withdraw for his “unethical” ads on the issue. Reporters Cara MacDonald and Ed Collins contributed to this report.